How to Clean A Cooktop: Just Wet It and Scrub! 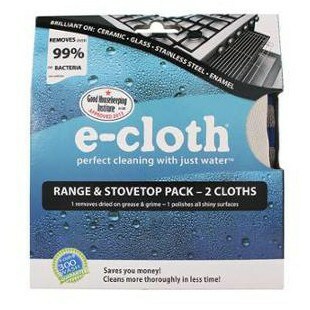 - E-Cloth Inc.
How to Clean A Cooktop: Just Wet It and Scrub! – Preventing toxic solvents and residue away from contaminating food prep and cooking surfaces. Stephani at Bacon and Whipped Cream recently reviewed the Range & Stovetop Pack. Not only did it clean her stovetop, but it even got rid of the residue that her previous cleaning method left behind! Keep reading below to see what she thought. I have a few main goals in life, and two of them are simplicity and healthy living. As I’ve been working to minimize my home and see what I truly need & use, I’ve found myself throwing out a lot of those extra cleaning products that I always had around. Due to the “healthy living” part of my life, I have gotten rid of a lot of cleaning chemicals over time. Slowly I’ve replaced them with healthy, more natural alternatives. So when e-cloth contacted me to see if I wanted to try out their cleaning cloths that require NO cleaners at all to work, I was really excited. I’ve found with green cleaning that you really don’t need a lot to get the job done. Vinegar works miracles, as does baking soda. Heck you can conquer the cleaning world with those things! But cleaning with just a cloth & water?? Even simpler! “Each e-cloth has 1.6 million strands per square inch. It is this that gives the cloths their remarkable cleaning capability and their high absorbency. By combining e-cloth’s unique fiber technology with water, the cloths break up, lift, and hold grease, grime, and bacteria, which normal cloths leave behind. 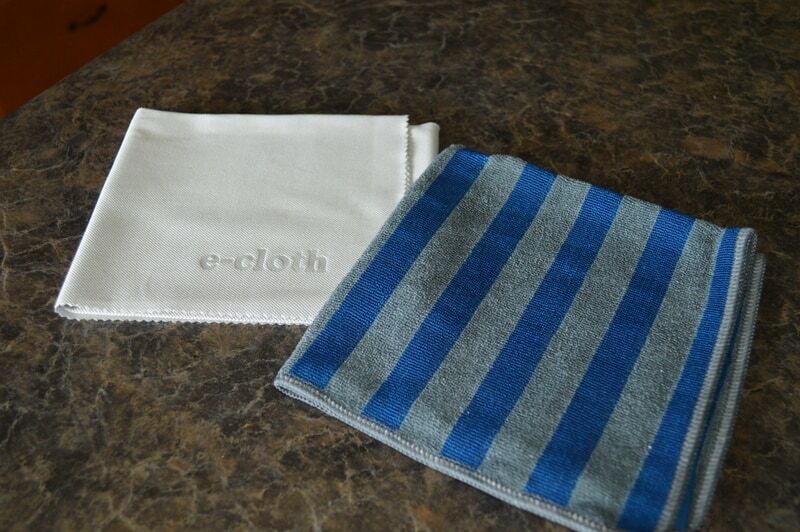 You can see more about e-cloth and how they work on their website. I chose the Range & Stovetop Pack, which is available for $14.99 on their site (purchased separately they are $7.99 each). It came with a range cleaning cloth & a finishing cloth. 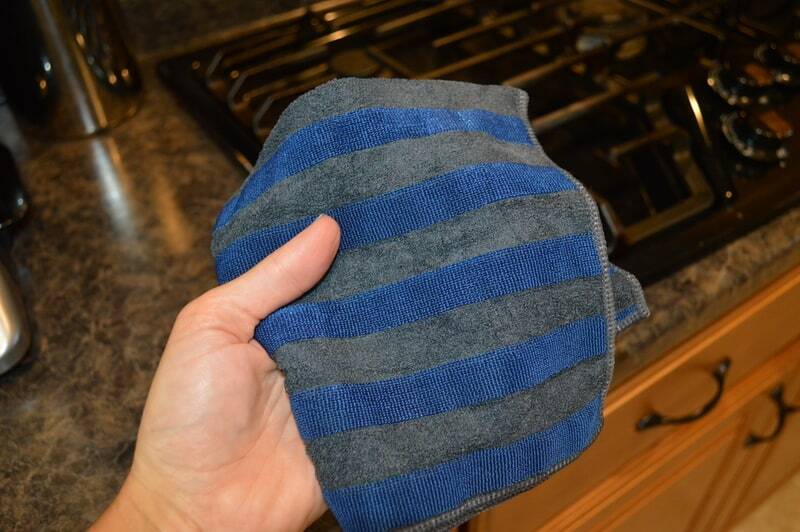 The range cloth is smooth on one side and has blue scrubbing stripes on the other side. The scrubby stripes safely remove dirt and grease without scratching the surface. The finishing cloth polishes the surface to leave a beautiful shine! To use, just get it wet & scrub! Really that’s it! No cleaners required. Here’s a little before & after. Now I had actually just cleaned my stove about 2 days before this and it had a little use on this burner. However that residue you see? That’s what was left over from cleaning it with my previous method (green cleaning spray & a wash cloth). And after using the e-cloth…the results are beautiful & shiny! Love it! In addition to this range cloth and other kitchen cleaning products, e-cloth also offers cleaning products for your car, pets, general household cleaning, and even your body!